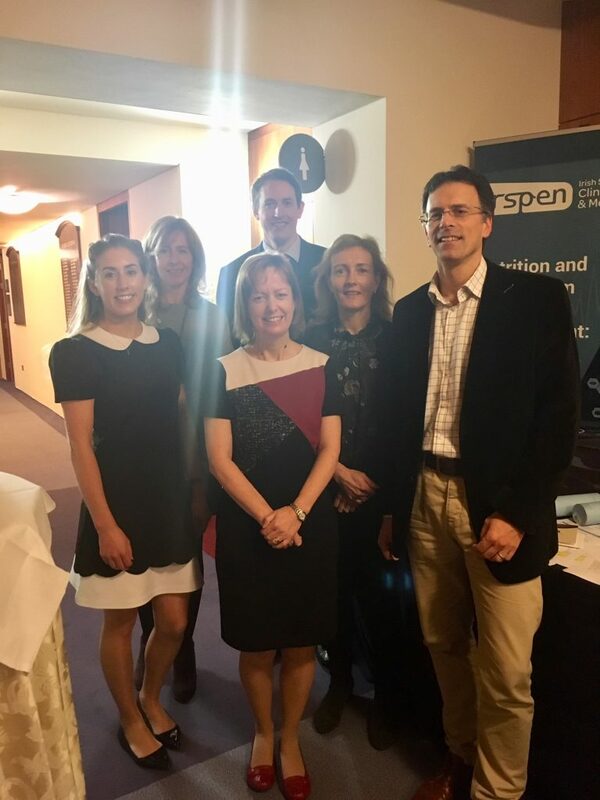 The faculty included Dr. Orla Crosbie (Chair of IrSPEN’s Education Committee; Consultant Gastroenterologist; Chair/Moderator; TLLL certified), Dr. Eoin Slattery (Consultant Gastroenterologist), Dr. Cara Dunne (Consultant Gastroenterologist), Dr. Karen Boland (Consultant Gastroenterologist) and Ms. Carmel O’Hanlon (TLLL certified; Clinical Specialist Dietitian). The faculty was ably assisted by: Ms. Fiona Rafferty (IrSPEN Education Committee) and Ms. Martina Smyth (IrSPEN Administrator). Nutrition and the compromised gut. Management of Short Bowel Syndrome (SBS). Nutrition and Inflammatory Bowel Disease (IBD). After the four modules, there was a very interactive case study, which generated some robust discussion. This was followed by a test quiz. A total of 13 participants took part in the day – 12 of these were medical doctors – mainly Gastroenterology Specialist Registrars. All participants took the test, 11 of the 13 participants passed. Each participant who passed the test was eligible for 4 LLL CME credits and was given a Course Certificate. 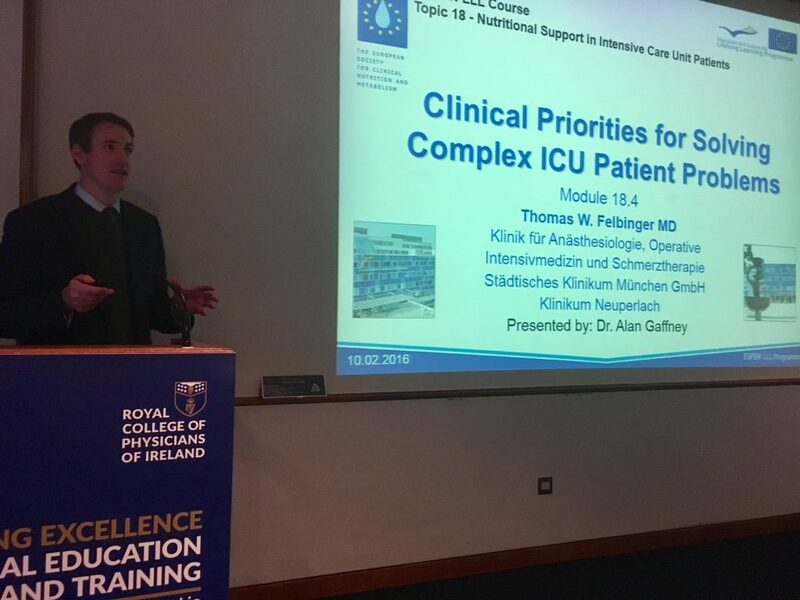 All doctors who attended also received RCPI CME credits. Turnout was lower than other years. The course, however, was very well received. Twelve participants completed evaluation forms. All 12 were very positive about their experiences. Overall quality was considered to be excellent by 98% of respondents. Participants enjoyed the course and found it an ‘excellent course, good interaction and well aimed to target audience’. Some participants preferred the smaller group, reporting that ‘small group sessions’ are ‘very helpful as more interaction involved’. 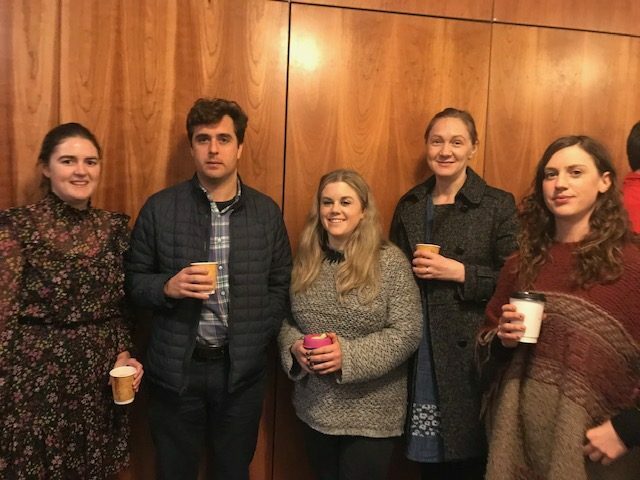 The faculty included Dr. Orla Crosbie (Chair of IrSPEN’s Education Committee; Consultant Gastroenterologist; Chair/Moderator; TLLL certified), Dr. Alan Gaffney (Consultant Anaesthetist), Dr. Seosamh O’Riain (Consultant Anaesthetist), Ms. Aine Kelly (Senior Dietitian in ICU) and Ms. Carmel O’Hanlon (TLLL certified; Clinical Specialist Dietitian). The faculty was ably assisted by: Ms. Fiona Rafferty (IrSPEN Education Committee) and Ms. Martina Smyth (IrSPEN Administrator). Energy and protein target: how to prevent underfeeding, overfeeding and refeeding syndrome. More than choosing a route: enteral and parenteral nutrition. Clinical priorities for solving complex ICU patent problems. After the four modules, there was an interactive case discussion, followed by a test quiz. A total of 26 participants took part in the day. Of these, 5 were dietitians and the remaining 21 were medical doctors – mainly Gastroenterology Specialist Registrars. All participants took the test and 96% passed. Each participant who passed the test was eligible for 3 LLL CME credits (once LLL username was provided) and a Course Certificate. All doctors who attended also received RCPI CME credits. The course was very well received. Twenty one participants completed evaluation forms. All 21 were very positive about their experiences. Overall quality was considered to be excellent by 77% of respondents and very good by 22%. Participants enjoyed the course and found it ‘very educational and relevant’ with ‘excellent speakers’ and ‘great topics’. 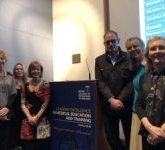 The faculty included Professor Remy Meier (ESPEN LLL Director), Dr. Orla Crosbie (Chair of IrSPEN’s Education Committee and Consultant Gastroenterologist), Dr. David Robinson (Consultant Geriatrician), Associate Professor Clare Corish (UCD), and Ms. Carmel O’Hanlon (Course Moderator and TLLL certified). The faculty was ably assisted by: Ms. Fiona Rafferty (IrSPEN Education Committee) and Ms. Martina Smyth (IrSPEN Administrator). Sarcopenia – causes of undernutrition. After the four modules, there were two case studies presented, followed by a test quiz at the end. A total of 45 participants took part in the day, of whom 43 completed the test. One of these participants lived and worked in Switzerland, the remainder were living and working in Ireland. Of the 45 participants, 93% were medical doctors – mainly Gastroenterology Specialist Registrars. 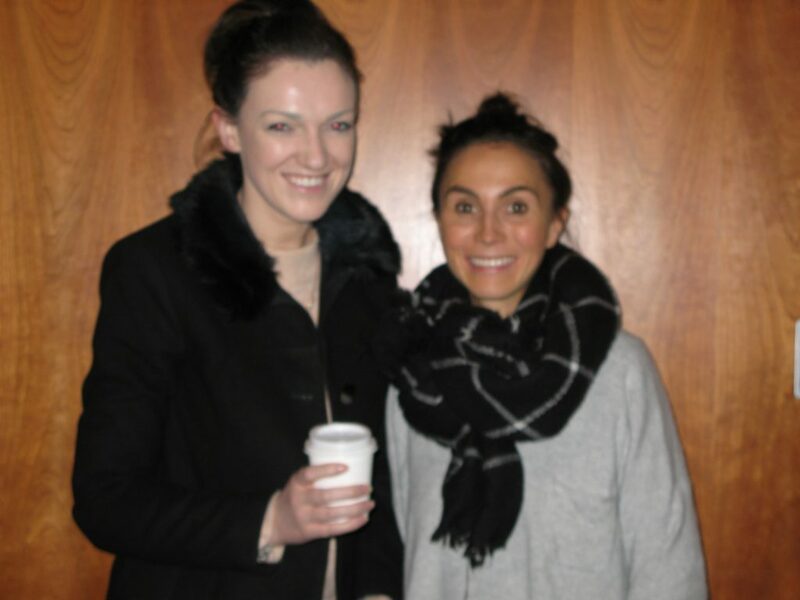 There was one dietitian and two nutritionists also in attendance. Of the 43 participants who took the test, 93% passed. Each participant who passed the test received 3 LLL CME credits and a Course Certificate. 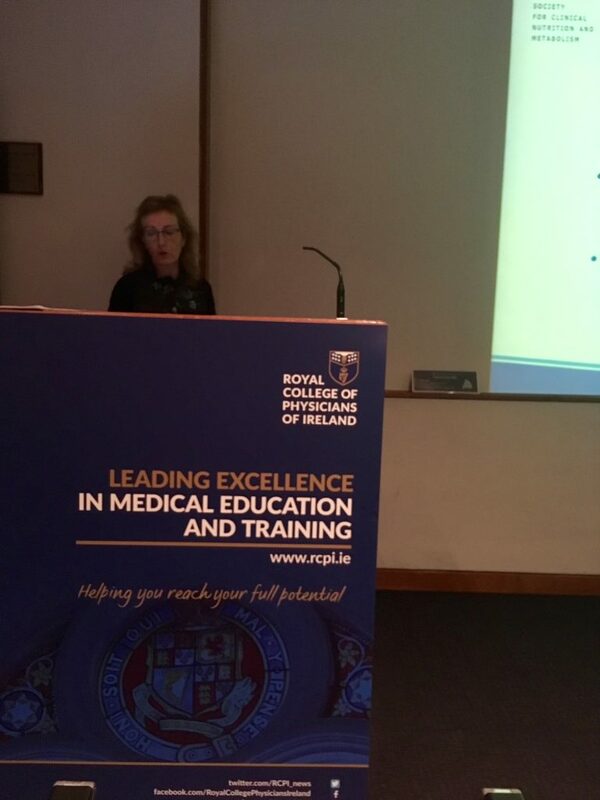 All doctors who attended from Ireland also received RCPI CME credits. The course was very well received. Forty participants completed anonymised evaluation forms. All 40 were very positive about their experiences and there was no negative feedback. 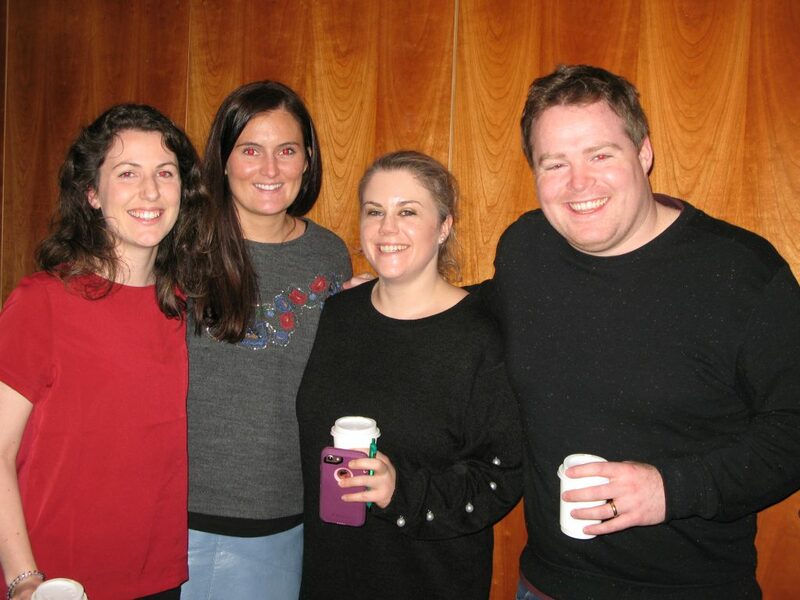 Participants enjoyed the course and found it beneficial with real potential for impacting on their practice. Participants requested further courses more frequently. 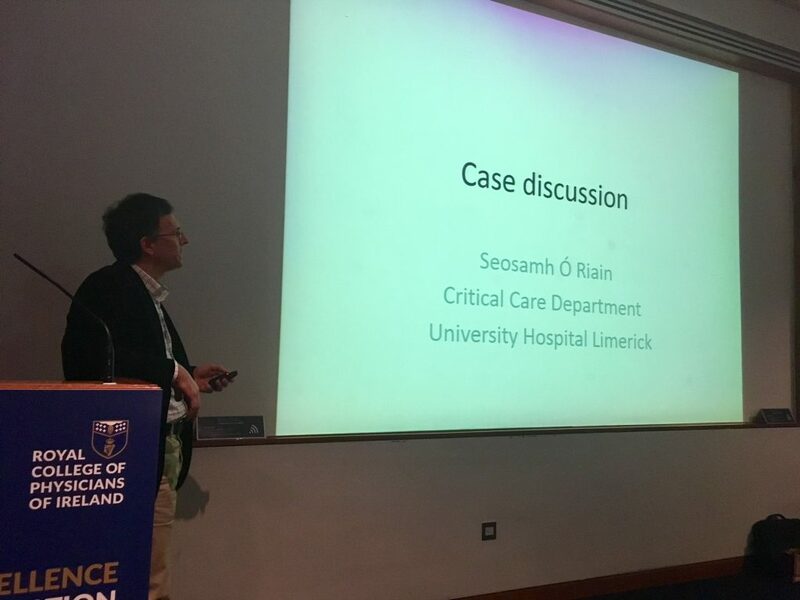 The second live module held in conjunction with the RCPI took place on Tuesday 20th May 2014 at the RCPI, Setanta House, Setanta Place, Dublin 2. The subject was Nutritional Support in Liver Disease (LLL Topic 13). 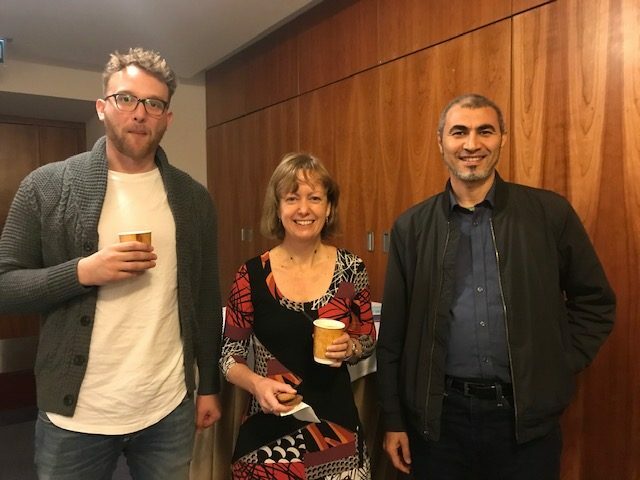 For the first time in Ireland, participants could gain ESPEN LLL credits for attending each live module and passing the short MCQ test (30 mins) associated with each module. In order to be eligible to take the test, you must be registered as an LLL programme user. More details on how to do this will be sent to you once you register with the RCPI for the module. Dr Jon Shaffer delivered the lecture on Nutritional Support in Liver Disease. 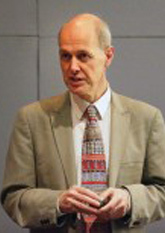 Jon Shaffer is a Gastroenterologist based at Salford Royal (formally known as Hope) Hospital in Manchester. He helped establish the Home Parenteral Nutrition service in 1980. The unit has experience of over 6oo patients, many of which have survived more than 20 years. He promoted the concept of “Intestinal Failure” and has lectured and advised nutrition societies all over the world in all aspects of intestinal failure. 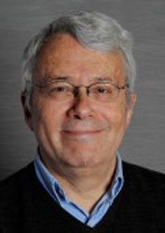 He has recently “semi-retired” from clinical work but still chairs the ESPEN Special Interest Group in Acute Intestinal Failure. Morning: Nutritional Screening, Assessment, Energy Balance with case presentation and discussion. 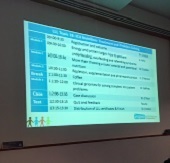 Afternoon: Causes of Obesity and Nutritional Interventions in Obesity with case presentation and discussion. Both sessions were accredited with 3 LLL modules each. At the end of both sessions, delegates were asked to participate in a quiz which included 30 questions, the pass mark was 24. 30 delegates attended, 28 of which took the nutritional assessment quiz, 26 passed, 2 delegates failed. 24 delegates took the obesity quiz, 17 passed and 7 failed. 21 of the 30 delegates are now registered for the LLL programme with ESPEN. Great opportunity to engage with the LLL program, a global program for training in clinical nutrition. Having had very little undergraduate or postgraduate training in nutrition, this course was a very useful and informative session. 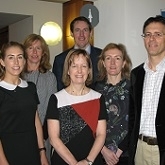 IrSPEN held a very successful Nutrition Training Day for NCHDs in the Royal College of Physicians in Ireland on 25th April 2012. 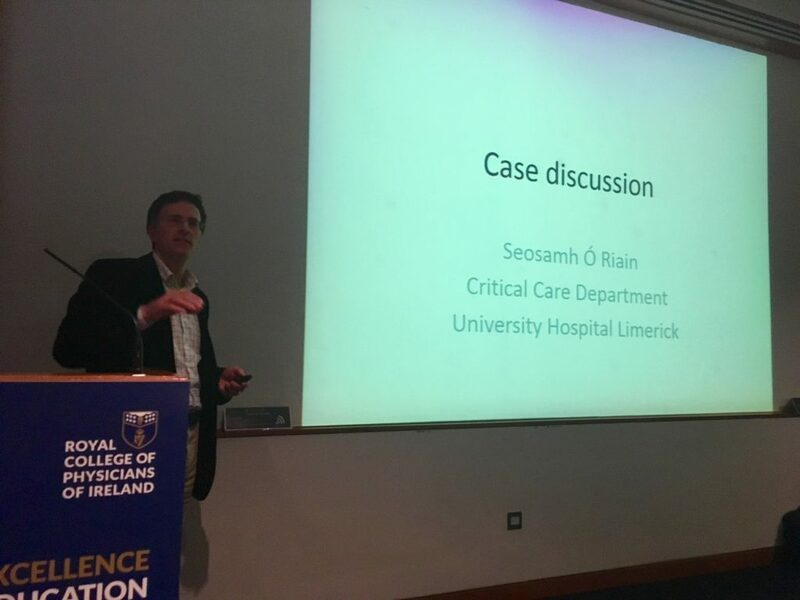 Amongst the presentations were: an interactive session on Fluid Management, an overview of Disease Related Malnutrition in the Irish healthcare system, Home Enteral Nutrition, the Refeeding Syndrome, Practicalities Of Parenteral Nutrition, Ethical Dilemmas In Artificial Nutrition Support and Nutritional Management Of The Obese Patient. We look forward to ongoing programmes with the RCPI. The programme and presentations are available below to download. 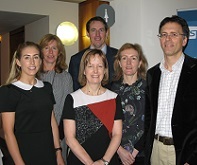 The inaugural IrSPEN Nutrition Study Day was held in RCPI On 7th January 2011. 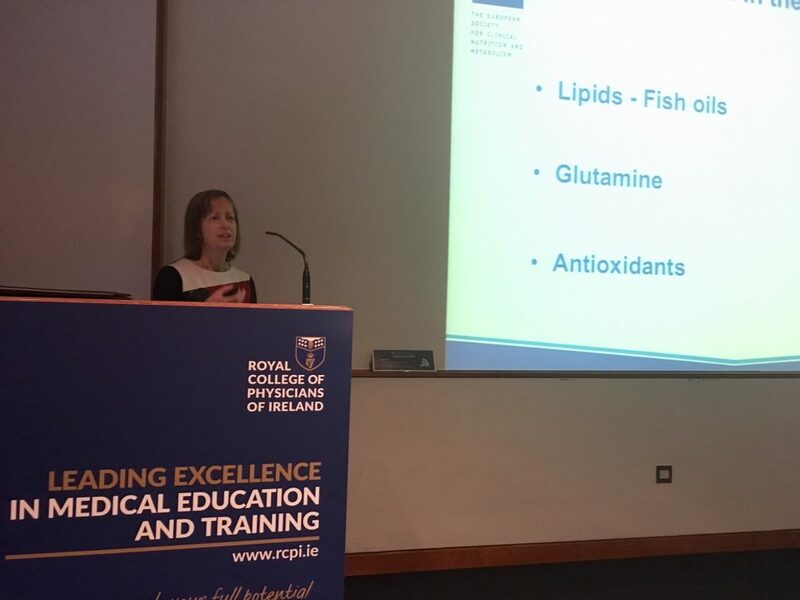 The study day went well with contributions from Dietitians, Gastroenterologists and Intensivists. 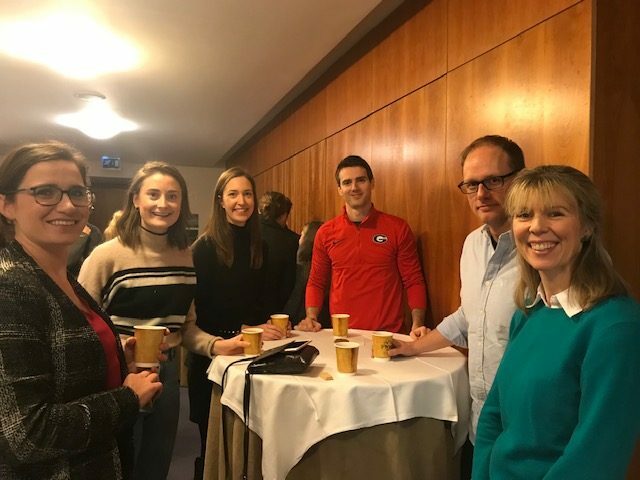 A huge thank-you is due to Carmel O’Hanlon Clinical Specialist Dietitian in Beaumont Hospital for her hard work in organising the event, and to Dr Nick Kennedy(TCD) for his role for the day as facilitator. Attendees were invited to submit a case study on a nutrition related case to be in with a chance of winning a €300 hotel voucher! 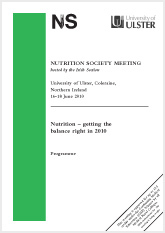 The programme and presentations are available below to download.